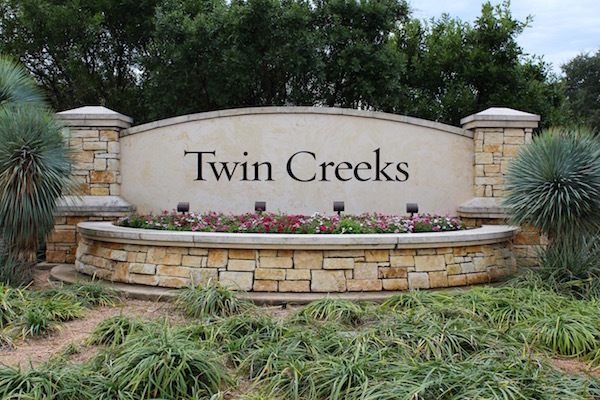 The Twin Creeks neighborhood is located off Anderson Mill Road in Cedar Park, TX. This area of Cedar Park is situated in Travis County close to Lake Travis at the edge of the beautiful Texas Hill Country. Most of Cedar Park is located in Williamson County. The neighborhood was recently annexed into the City of Cedar Park in 2014. Twin Creeks features a scenic and private, championship 7,033-yard, par 72 Fred Couples Signature Golf Course, Twin Creeks Country Club. Residents enjoy a mandatory membership that includes full use of the Club’s Family Activity Center amenities consisting of Fitness and Pool Privileges. Other Golf and Social Memberships are available to non residents. The neighborhood is known for rolling hills and panoramic vistas. The well manicured lawns and fine homes offer a welcoming and luxurious atmosphere. Homes in the neighborhood includes single family residences, custom estate home, golf course view homes and luxury town homes. The Reserve at Twin Creeks is the larger lot and view section of the neighborhood. These stately homes were the last section to be completed with homes built as recent as 2018.